Yellow wins! 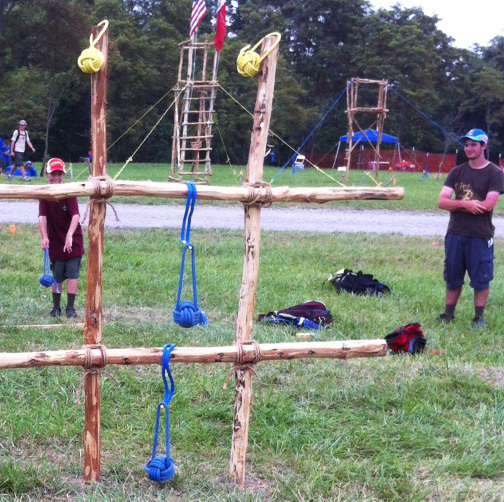 Two Scouts strike a pose after their game of tic-tac-toe. Just like the game where X’s and O’s are drawn on a piece of paper, this game is played by tossing large, weighted monkey fists through 2′ x 2′ areas formed in a vertical Tic-Tac-Toe board built by lashing together four 6′ spars. Scouts stand back 25′ and one at a time aim their colored monkey fist at whatever square they choose. If the shot goes through a square, that monkey fist is hung on the board at the corresponding square. And of course, three across wins.